Chester A. Mutryn (March 12, 1921 – March 24, 1995) was a professional American football halfback and defensive back in the All-America Football Conference and the National Football League. 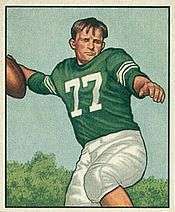 He was drafted by the Philadelphia Eagles in the 20th round of the 1943 NFL Draft. He was also drafted by the Eagles in the first round of the 1951 NFL Draft after the Baltimore Colts folded.